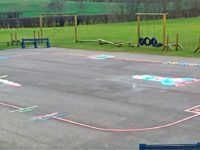 We installed a number of playground markings during our trip to Alderman Jacobs Primary School near Peterborough but the pick of the bunch was the impressive school logo our team put down at the main entrance. 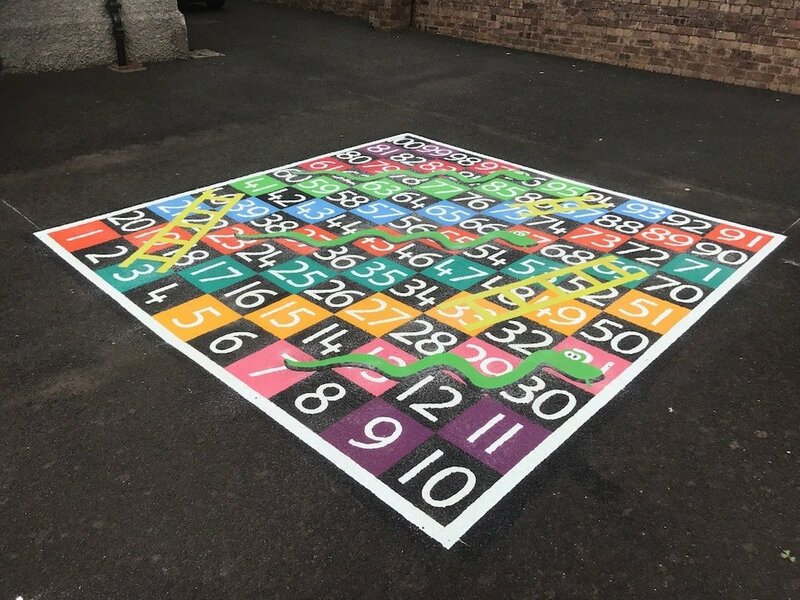 The install included ‘relining’ an old Snakes & Ladders design and putting down a new Rocket Hopscotch, 1-25 Spiral and an Alphabet Caterpillar. We saved the best till last… in front of the main entrance we installed the school logo which our graphic team had recreated from artwork the school had sent through. The finely detailed logo depicts a couple of Straw Bears or “Strawbowers” who are part of a local custom in the area, surrounded by the school name on a circular path within a sun shaped outer graphic. This kind of complex design would have been almost impossible to create a couple of years ago but thanks to our investment in a state of the art computer controlled cutting machine a design like this can be produced at an affordable price*. *If you have a school logo that you would like to reproduce as a graphic at the entrance to your school or in the playground, email us through an example and we will give you a quote for the design and install. The children have been so pleased with markings. I looked on the CCTV camera and could see them playing on them all day. Thank you very much. I just wanted to say a massive thank you for the work that has been completed at Stakeford Primary School. The customer service we have received has been outstanding from start to finish and the work has been done to a really high standard. 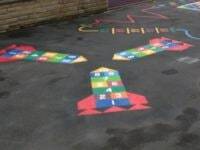 The children love the new markings. We will certainly be using your company again, many thanks. first4playgrounds were absolutely fantastic. They couldn’t have been any more professional in all aspects of their work, they go straight to the top of our recommended contractors list. We are extremely pleased with the service and outcome! 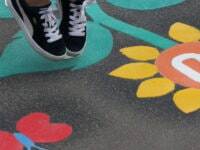 The children were amazed to see your colourful designs and it has really breathed a new lease of life into a ‘tired’ playground. We are very happy with the service we received from first4playgrounds, from the first point of contact through to the Alphabet Snail being installed and Invoice being received the communication was prompt and friendly. Highly Recommended! Thanks for the markings – they look great! We look forward to using your services again in the future. The school logo is very impressive and is a really good visual point for all parents, children and visitors that come into the school. 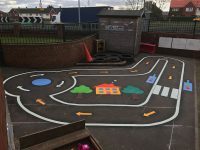 We are very happy with the service we received from first4playgrounds, from the first point of contact through to the Alphabet Snail being installed and Invoice being received the communication was prompt and friendly. The men who installed the Snail did so quickly and unobtrusively. Highly Recommended! The work was carried out to a high standard by pleasant and affable workmen. I would not hesitate to recommend first4playgrounds to schools and colleges. Thank you. Thank you very much. The service you provided was excellent. You were very adaptable to the timings of our school day and our needs. What is excellent is that the markings were tailored to suit our needs. We adapted the brochure ideas and nothing was a problem. I can’t wait for phase two to begin. Thank you for a prompt service.